We stamped the colour wash image three times in Wisteria Wonder, then stamped the sentiment in Jet Black StazOn. The flowers were punched with the Petite Petals Punch, the tiny gold flowers were punched with the Itty Bitty Punch Pack. A little Rhinestone Jewel is added to the centre of each gold flower and the leaves were made with the Little Leaves Sizzlit and the Big Shot. For our second card we used a technique called emboss resist. 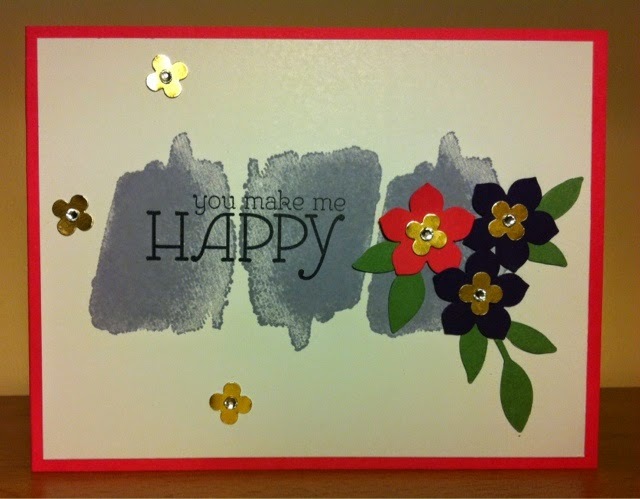 We stamped the floral image with Versa Mark ink and heat embossed it with White Embossing Powder. Then we painted over the image with an Aqua Painter and ink from the lid of our classic ink pads in the 2013-2015 in-colors. We attached a strip of the gold striped design from the washi tape collection; Watercolor Wonder. 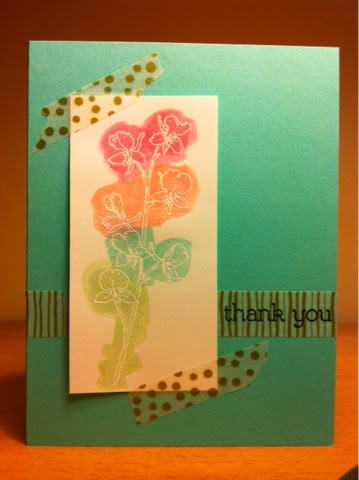 We stamped thank you, also from Happy Watercolor, directly onto the wash tape with Jet Black StazOn. Once the floral panel was dry, we attached it to the card with two pieces of the gold polka dot design from the same collection. Fast and easy, and it looks better in real life. Gold is tricky to photograph! Our third project was a simple little gift box, but since I forgot to take a photo of it, I'll have to save that idea for another post.